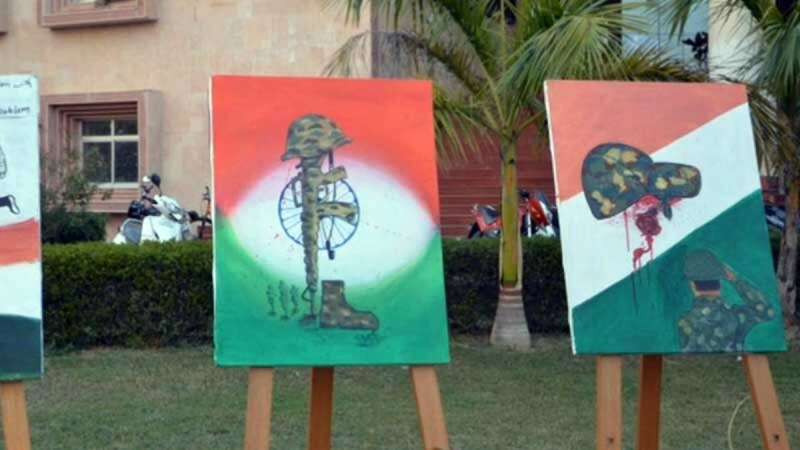 New Delhi : All Indian Rajiv Congress Party (AIRCP) is going to organise a Hawan at New Delhi's Jantar-Mantar on February 25 to pray for the departed souls of slain CRPF jawans who lost their lives in the cowardly Pulwama Terror attack. 44 CRPF personnel were martyred on February 14 in a fidayeen attack in the state of Jammu & Kashmir when a Jaish-e-Mohammed terrorist rammed a vehicle in the bus carrying the jawans. AIRCP will pay its tribute to all 44 slain jawans who became a victim of the cowardly act of the Pakistan-sponsored terrorism. Party's national president Vinod Sharma condemned Pakistan for is cowardice and claimed the neighbouring country is clearly involved in the killing of the Indian soldiers. He maintained that Pakistan will have to pay a heavy price for shedding Indian blood. Mr Sharma informed that his party has organised a Hawan at 11 am at Jantar-Mantar for the departed soldiers which will be performed by Kashmiri Pandits. Mr Sharma stated that he has been associated with the Congress Party for many years but the grand-old-party of India's policy of dividing the society into communal lines and corrupt practices alienated him from the party and he eventually severed his ties. With an aim to maintain the secular fabric of the society and promote the feeling of nationalism amongst the people, he launched All Indian Rajiv Congress Party. He stated that Congress has become a party of anti-Hindu sentiments and reminded that even Mahatma Gandhi had proposed to dissolve the Congress Party post-Independence. Mr Sharma further added that being fed up with the Congress-led UPA Government's poor strategies and corrupt reign, people voted the BJP to power in 2014 Lok Sabha Polls. BJP made tall promises during the polls campaigns, but it too cheated the people with its rhetoric in the last five years. AIRCP National President cleared that his party has nothing to do with Rahul Gandhi or Sonia Gandhi and that it is completely different from Congress. According to Mr Sharma, Congress has reduced to the ashes and that the party knows nothing about the problems of the people. Congress detached itself from the issues which concern the general public. AIRCP's General Secretary Suresh Goyal said after the 2016 Uri attacks, Pulwama incident is the biggest terrorist attack on Indian soil. He informed that their party will pray for the martyred soldiers who lost their lives in Pulwama. He further stated that both Congress and BJP have cheated with the people of the country. Mr Goyal claimed both the political parties have treated the poor like beggars. "Poor don't need your charity, they need employment," he concluded.